Citation Information: JCI Insight. 2018;3(7):e95676. https://doi.org/10.1172/jci.insight.95676. Replication competent HIV-1 persists in a subpopulation of CD4+ T lymphocytes despite prolonged antiretroviral treatment. This residual reservoir of infected cells harbors transcriptionally silent provirus capable of reigniting productive infection upon discontinuation of antiretroviral therapy. Certain classes of drugs can activate latent virus but not at levels that lead to reductions in HIV-1 reservoir size in vivo. Here, we show the utility of CD4+ receptor targeting exosomes as an HIV-1 latency reversal agent (LRA). We engineered human cellular exosomes to express HIV-1 Tat, a protein that is a potent transactivator of viral transcription. Preparations of exosomal Tat-activated HIV-1 in primary, resting CD4+ T lymphocytes isolated from antiretroviral-treated individuals with prolonged periods of viral suppression and led to the production of replication competent HIV-1. Furthermore, exosomal Tat increased the potency of selected LRA by over 30-fold in terms of HIV-1 mRNA expression, thereby establishing it as a potentially new class of biologic product with possible combinatorial utility in targeting latent HIV-1. Exosomal localization and biological activity of modified HIV-1 Tat expression vectors. (A) Using an expression vector encoding WT HIV-1 Tat (pTat), we profiled protein levels in cell lysates of transfected HEK293T cells, as well as in released exosomes of 30–150 nm in diameter. 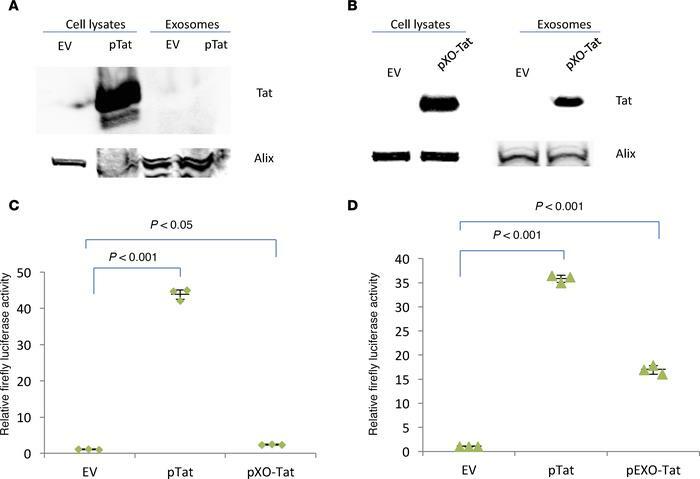 Western blot revealed robust expression of Tat in cellular lysates but not in released exosomes. An empty expression vector (EV) was used as a control. The exosome marker Alix was used to control for protein loading. (B) We modified the Tat expression vector to include a peptide sequence that targets proteins to the interior exosomal membrane (pXO-Tat). Western blot of transfected HEK293T cells revealed Tat protein expression in both cellular lysates and exosomal preparations. No Tat protein was detected with use of the EV. The exosome marker Alix was used to control for protein loading. (C and D) The TZM-bl cell line was used to quantify the transactivating activity of Tat produced by WT (pTat), exosomal localization modified (pXO-Tat), and nuclear/exosomal localization modified (pEXO-Tat) EVs. Exosomal localization (pXO-Tat) decreased transactivating activity that depends upon nuclear localization of Tat (C). Inclusion of a c-Myc nuclear localization signal (NLS) increased activity to ~50% of WT Tat levels (pTat) (D). Experiments were performed in triplicate with 2 technical replicates. Quantitative data was analyzed by ANOVA with between-group comparisons evaluated with post-hoc Tukey-Kramer HSD tests, which correct for multiple comparison. Data are expressed as mean ± SEM. P < 0.05 indicates statistical significance.